Will serve Hales Mills Road Ext. 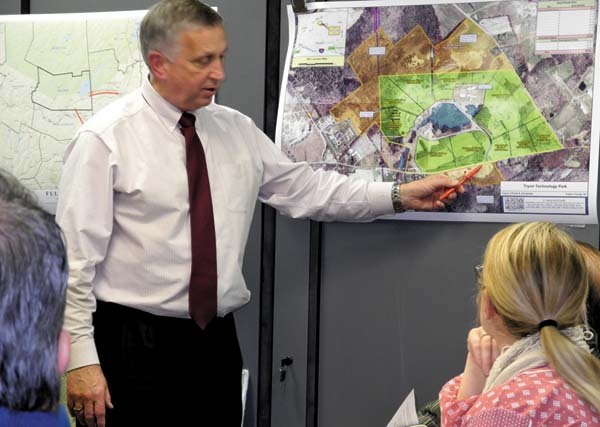 JOHNSTOWN — The Fulton County Board of Supervisors on Monday established the county’s second water district, which will serve the Hales Mills Road Extension area from the city of Gloversville to the town of Johnstown. Fulton County has earmarked a 2017 capital project for a Smart Waters program waterline for Hales Mills Road Extension in the town of Johnstown. The project is the county’s first major Smart Waters initiative — a program established in 2014. The county hopes to attract new housing, commercial and retail ventures, and grow the tax base while creating jobs and improving quality of life. The county is trying to establish public water services along the road to build on retail development begun a few years ago with the nearby Gloversville Walmart Supercenter on South Kingsboro Avenue Extension. The resolution creating Fulton County Water District No. 2 includes a waterline project. The project involves installation of 6,075 linear feet of a new 12-inch water main, hydrants, valves and a boring under Route 29. The line would be installed on the west side of Hales Mills Road Extension. No one spoke at a public hearing Monday on a draft map, plan and report for the water district. The report was done by Environmental Design Partnership of Clifton Park. Supervisors also passed three other resolutions related to the Hales Mills Road Extension development. The board declared itself lead agency for the state Environmental Quality Review process related to the district. Supervisors approved awarding a $690,340 low bid and alternates contract to R.B. Robinson Contracting of Candor, Tioga County, for construction for the Hales Mills Road waterline project. The board also authorized a resolution awarding a $22,500 contract to Environmental Design Partnership for construction administration for the project. In discussing approvals of solar array projects surfacing in Fulton County, Gloversville 1st Ward Marie Born commented that the county should be encouraging them to be sited at “business friendly” areas such as Hales Mills Road Extension. “I think we have to be careful in the future,” Born said.